Those colorful little fake flowers take me back to my childhood. I remember helping my moms friends assemble these little poppies for our local VFW. I remember hearing war stories from my parents friends as a kid. And, I remember volunteering at the Veterans Home with elderly war heroes. Some of them were missing legs, and many survived things I am lucky enough to not have experienced. My girls are the same age I was when I first learned about the sacrifices of our American war Veterans. “Yes, sweetheart why don’t we each get one.” I gave them each a dollar bill to hand to the gentleman in exchange for a bright red poppy. He thanked them and complimented their generosity. I thanked him for his service and shared that both my father and my father in law were Vietnam War Veterans. His heart genuinely broke when I shared with him that they both passed away over a decade ago to cancer in their early fifties. Seeing these poppies reminded me of them. I am grateful for their service to our country, their service to our families and I am thankful they made it home to all of us. Happy Veteran’s Day to my Dad, my Father In-law and all my aunts, uncles and cousins who have all served in the military. Thank you to all our Veterans who have served and continue to serve! Thank you to the wives, children and families who have loved ones serving in the military. Your sacrifices are important too! Buddy Poppies are assembled by disabled Veterans and Veterans in need. This helps provide them with a small income and the sales help fund programs for Veterans. You can watch the short video below to learn more about the VFW Buddy Poppy program. And, remember to thank a Veteran today! 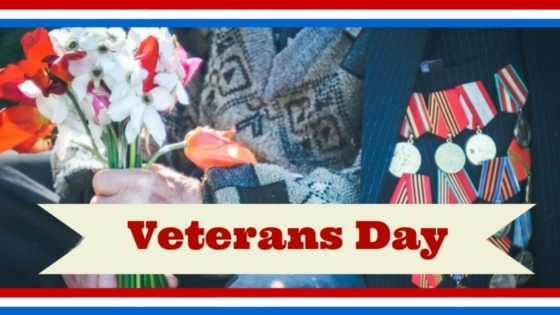 Click here are some great ideas to help children celebrate Veteran’s Day. « Friday Favorites – Start a Friendsgiving Tradition! Such a sweet story. I had no idea about this tradition of buddy poppys. Definitely something I will be sharing with my kids. I had never heard of this before. Thanks for sharing this lovely story, I learned something new today! This is wonderful! My grandfathers both served in the military and I have an uncle who did as well. Supporting our veterans is definitely something that is important to our family. I love the poppies story. We always purchase them when we see someone selling. Oh, I remember Buddy Poppies! I didn’t see any this year, though. I don’t see them as often either. Was excited when I saw them this year. Now I know where to find them again next year! What a sweet story. I never realized the significance of the poppies. Thank you for sharing your story about supporting our veterans. I had no idea about the buddy poppys – that is good to know! I have many veterans in my family so it is an important day for all of us. Thanks! They were pretty amazing humans considering what they survived! What a beautiful story. My grandfather is a WWII vet. It’s so nice that up until now, he still gets support from the government even if he is not living in the US anymore. If I were to list the veterans I know, the list would get long. Veteran’s Day is special to me because I grew up in a military household and I’ve now married into one. The military has always been (and always will be) a big part of my life. Thank you so much for sharing this story and the history behind it! Happy Veteran’s Day! Happy Veteran’s day to all of your loved ones!! Thank you all for your sacrifices! I am proud of how many veterans I have in my family. It’s so important to give them thanks. This is so nice! This is the first time I have heard of this. I’ve always loved the poppies but I had no idea about the story! Thank you so much for sharing!